Don't Drive to Dinner: Making Plans for BBQ (pt2) - How much BBQ can a man eat? Making Plans for BBQ (pt2) - How much BBQ can a man eat? Well, it's Tuesday, so it must be roadtrip planning day! (although I'm writing this in the pub and will probably wait until tomorrow until I actually post this, so I can scan for beer induced hyperbole with a clear head). What I'm trying to work out is how to fit five BBQ joints into three days. I think I have no choice but to eat three lunches in one day - although I will be in good company if I do. But more of that later. 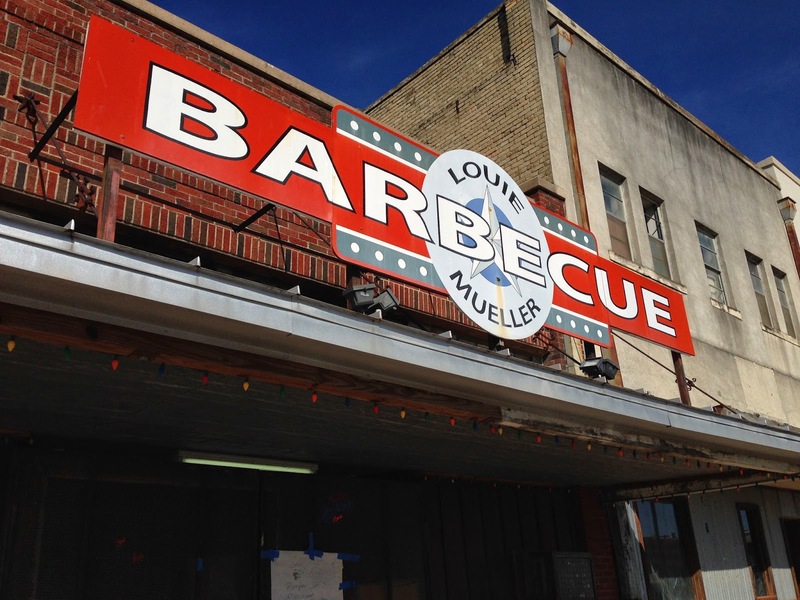 The first day is easy - off to Louie Mueller's in Taylor. Everything I read points here - hell, even Wikipedia seems to be telling me I should go. Man Up Texas BBQ gave it a near clean sweep. Even the NY Times says to go. Enough already, it's my first stop! So how did this pretty pickle happen? Well, Zagat have a 'handy' infographic to explain the connections between the restaurants - there's intrigue, in-fighting and a dynasty to compare with the Borgias here. As far as I can tell, a family feud in the Schmidt family caused the Kreuz Market to move to a new location, while the old restaurant became Smitty's. Quite where Blacks fits into this I'm not sure - the beer is starting to make the lines in Zagat's infographic move of their own accord. And I'm turning a blind eye to newcomer the Chisolm Trail BBQ (so hip, it has no website) that some are saying eclipses them all. No, no one can eat four lunches. Surely? The final day in Austin, and it's off on a drive through Hill Country with a stop off at Cooper's BBQ in Llano for lunch. Just one barbecue that day (I don't want to fall asleep behind the wheel), and then I'm moving south to San Antonio - and next week I'll tell you more about that! If you can’t fit in all the BBQ restaurants in Lockhart in one day, a second best option may be available for you back in Dallas. I’ve enjoyed multiple delicious meals at their Bishop Arts location, and have even gone back to visit it even after we had to move to San Antonio. I’ve yet to eat at their new location in Plano, but I’ve read it is up-to the same standards as their first location. Where were you when I was planning this trip? :) Great tips, thank you for all your comments!